Amblyopia is sometimes referred to as a ‘Lazy Eye’. It implies that the eye is healthy but suffers from reduced vision even when fully corrected by glasses or contact lenses. In order for a child’s vision to develop normally the brain must receive clear and aligned images from both eyes. When a condition interferes with either a clear image or properly aligned images from both eyes, the brain over time can learn to permanently ignore the ‘weaker’ eye and favor the ‘stronger’ eye. This condition is called Amblyopia, commonly referred to as ‘lazy eye.’ Amblyopia is most commonly associated with a turned eye but may also be caused by a large or unequal refractive error between the eyes. In rare cases, Amblyopia may result if vision is blocked by a cataract, corneal scar, droopy eyelid, or excessive patching therapy. 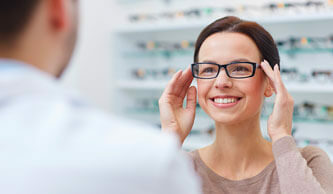 The initial stage in treating Amblyopia is to address any refractive error using the best possible prescription for eyeglasses or contact lenses. There are numerous treatment techniques based on the cause and degree of amblyopia. 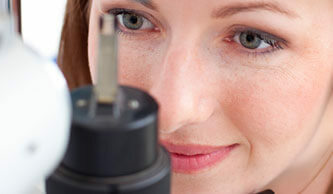 The techniques range from prescribing specialty glasses such as the “Shaw Lens”, which matches retinal image sizes between the two eyes. Sometimes the dominant eye is blurred to force the lazy eye to be used and improve vision. Misalignment of the eyes, strabismus, is sometimes addressed by Vision Therapy, which is a training technique which trains the eyes to work together. In severe strabismus cases surgery is necessary to realign the eyes. In many cases more than one technique is employed in the treatment of amblyopia. Treating amblyopia as early as possible is the most effective way to restore vision, and have the best possible outcome. Since vision continues to develop until the age of nine, it is imperative to treat amblyopia early in life. If the amblyopia has not been treated before this age of full development, the child is at risk of never developing normal vision. Parents have a vital role in ensuring that this does not happen to their child. If your child is diagnosed with amblyopia, it is important that the doctor’s instructions are strictly followed. Detection is the key. Parents must realize that children with amblyopia look and function completely normal as they still use one eye to see. However, warning signs include an eye that turns in or out or up, or a child who noticeably uses one eye to see. Since parents may not be able to detect amblyopia themselves, it is important that children be seen by an eye care professional for an assessment before preschool age.